We arrived to Buenas Aires on Sunday morning by bus (a comfortable bus that had big seats that reclined, the best way to travel!) The streets were very quiet so we took some great pictures of the widest street in Buenos Aires called el 9 de Julio (July 9). We found a cheap hotel for 85 pesos which is about $28 a night. It was in a seedy neighborhood but every neighborhood is questionable in Buenos Aires, you could say it just adds to the adventure! I have never seen so many FOR SALE signs on practically every building, and this is because of the ¨economic crisis.¨ There is a saying in spanish that says ¨When the United States Sneezes, the Whole World Gets a Cold.¨ Most Americans have no idea how much the US determines the well-being of the people in the rest of the world. My favorite area was a renovated port called Puerto Madero. They have taken the old warehouse buildings and renovated them into offices, restaurants, and shops for the tourist. The weather was beautiful and we walked the whole length of the port and took many pictures. All the pictures are in the photo gallery called Buenos Aires. We also saw the equivalent of our White House, which here is called the Pink House! (La Casa Rosada) And its just a coincidence that the President of Argentina at this moment is a women and she lives in the Pink House. ha ha ha. I hope you enjoy looking at my pictures. 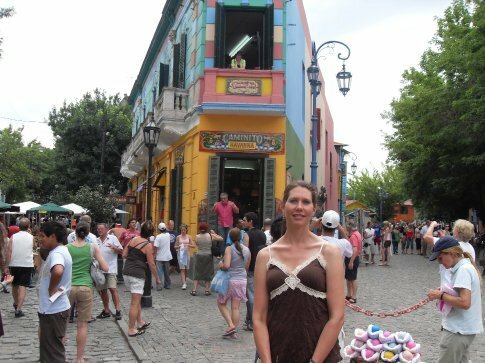 Buenos Aires was a nice city to visit. I sure had a great weekend. It always helps to have a good traveling companion to make traveling fun too! Thanks for the Christmas Card -- you make me smile! By reading about your Christmas, it sounds (and looks by the pictures) like it was truly a wonderful celebration. Those paper balloons look so fun.